Contrasting approaches to accelerate the timeline of a project that would add a southbound auxiliary lane on I-5 near Wilsonville and seismically retrofit the Boone Bridge are taking shape at the Oregon Legislature. Sen. Alan Olsen, R-Canby, has proposed Senate Bill 1021, which asks for the state government to fund the approximately $134 million project outright, while Wilsonville representatives are attempting to get a $3.5 million engineering analysis for the project funded in the next biennium. "Everybody is impacted by it (the Boone Bridge). If that bridge goes down, nothing moves. There's no way to get past the Willamette River," Olsen said. "It's (Senate Bill 1021) an extremely important piece of legislation to protect all Oregonians." The I-5 Wilsonville Facility Plan, which materialized after the Oregon Department of Transportation studied the I-5 traffic bottleneck and determined that a southbound auxiliary lane between the Wilsonville Road exit and the Canby-Hubbard exit would significantly reduce congestion, was placed into the Oregon Transportation Plan last year with a projected completion date between 2028 and 2040. The state considers retrofitting the Boone Bridge to be a lower priority than retrofitting some other bridges in Oregon, and ODOT merged the seismic retrofitting and lane addition with the belief that they might become a higher legislative priority together than apart. Moving up the project's timeline is one of the City of Wilsonville's highest legislative priorities. Olsen met with Wilsonville Mayor Tim Knapp last year about the project and the City sent Olsen proposed bill language for the engineering analysis. However, Olsen decided to propose a bill that would fund the entire project instead. As of last week, the bill was referred to the Joint Committee on Ways and Means and had not received a hearing. "The study takes forever, years and years, and you don't get anything out of it. Let's just get the thing built," Olsen said. "That's typical government speak. 'Let's study it.' Not for me." Knapp, Wilsonville Councilor Ben West and Rep. Courtney Neron, D-Wilsonville, support Olsen's bill but think the study is a more realistic way to move the project forward. Knapp also said the study could lead to a thorough idea of what the project would entail and a more accurate cost estimate. "I believe it's more realistic that we will get $3.5 million for the study," West said. "I would be over the moon happy if we could push for the whole thing. Most likely I don't think there's a pathway for that." Whereas Olsen's bill asks for state money to fund the project, Wilsonville representatives hope to leverage the engineering study to convince the U.S. Congress and specifically Rep. Peter DeFazio, who represents Oregon's fourth district in the House of Representatives and is the Chairman of the House Transportation and Infrastructure Committee, that the project has been thoroughly planned and would be worth funding through the federal government. "I think we'll be asking for the bulk to be (funded) by the federal government," West said. 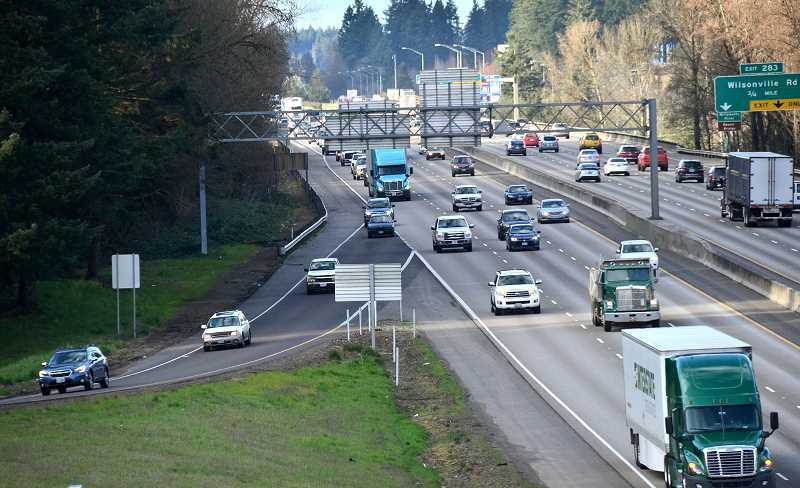 Officials also said the state Legislature currently is more likely to dish out exorbitant funds for the proposed improvement projects on Highway 217, I-5 near the Rose Quarter in Portland, and I-205. "Wilsonville has been and continues to be supportive of regional priorities for the 217 project, the I-205 project and the Rose Quarter project," Knapp said. "We're not trying to make an end run around those. We'd like to see the Boone Bridge project be the next big project after that." Wilsonville representatives hope the study would be funded through a transportation appropriations bill that likely would be addressed in the latter portion of the legislative session. Neron mentioned that the state budget might be too tight for Olsen's bill to pass. "I signed on as a sponsor for the Boone Bridge bill and I'm working in various ways behind the scenes to talk to people about getting the funding for design work and potentially some engineering (work)," Neron said. "The bill is exciting because it keeps the conversation alive. It might not be the ultimate way that we fund it because funding something out of the general fund this year might be rather difficult." To make the engineering study come to fruition, Neron, West and Wilsonville lobbyist Greg Leo are busy lobbying legislators at the Capitol. "It's almost like a three-pronged effect between Courtney, myself and Greg Leo. We all have different strengths and relationships with people who have a say in this. We're trying to leverage that to make it (the project) a priority," West said.